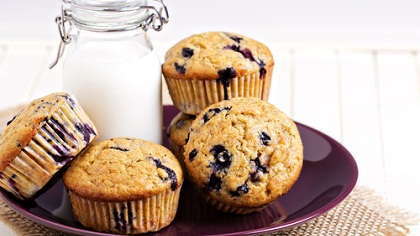 Try these delicious whole-wheat banana blueberry muffins. High in fiber and fruit and low in sugar, these whole-wheat banana blueberry muffins make a great after school snack or lunchtime treat. Combine flour, sugar, salt, and baking powder in a large bowl; make a well in the center of mixture. Combine egg, banana, milk, and oil; add mixture to dry ingredients stirring until just moistened. Spoon batter into greased muffin pans filling three-fourths full.